COMMUNICATIONS DIRECTOR of the National Democratic Congress (NDC), John Dramani Mahama, has declared that Prof. John Evans Atta Mills, presidential candidate of his party, would outsmart President John Agyekum Kufuor in the forthcoming presidential debates prior to the elections. "I am confident that if we have the presidential debate, our candidate would excel and come out very well because he has the ability to understand the questions. He has a firm ground. He has the experience of governing. With his intellectual capacity, honesty and besides being the former vice president of the nation, I am sure that he would excel." He continued, "I also think that it would be quite good value to have the debate because we have a presidential candidate who is very sharp and eloquent and I think that he has a firm grasp of the issues. It is not only that he is sharp and eloquent but also I think it is in the interest of the nation to have the presidential debates." John Mahama, who was speaking to The Chronicle in an interview yesterday on the proposed presidential debate and how it would affect the voting pattern in favour of the NDC, stated that Prof. Mills, who spearheaded the nation for sometime as the Vice President, would shape the minds of the electorate with the debate because he speaks very well and is very articulate on national issues. Asked whether it was Prof. Mills' articulation and eloquence that warranted the NDC to advocate for the debate, the NDC MP for Bole Bamboi replied in the negative. "Presidential debates or no debates, there would be election. We are moving forward for another qualitative election and that is why we are having presidential debate." He said, "I think it would be quite valuable to our presidential candidate who is very sharp and eloquent on issues. It can only add value to our democratic process." According to him, this year's presidential debate would add excitement to the forthcoming elections. "This election has lacked this spark and excitement that had characterized the last three elections." John Mahama, taking the lack of spark and excitement into account, predicted voter apathy. 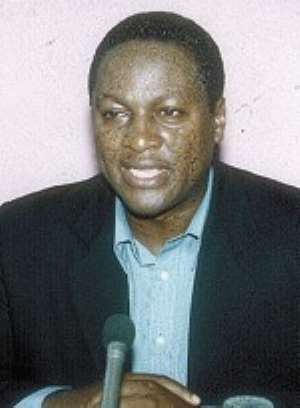 "I can only predict voter apathy because you come across many people who, following the promises that the NPP made in 2000 and the positive change they promised which have failed to materialize, are saying that well, even if we go and vote, it would not make any change in our lives, so we would rather not exercise our franchise." Based on this situation, he called on all the political parties to try to intensify the voter education and teach people why it is important to vote, hinting that the nation had reached a certain stage in its democratic development where the people who put up themselves to seek the highest office in the land should be subjected to debates. Rationalizing reasons for the debate, John Mahama, the minority spokesperson in parliament on communications said, it enhances democracy and makes it possible for the electorate to make an appraisal of the candidates and find out who has grasp of the issues. "I think that presidential debates are very necessary because it enhances our democratic process. Elections are about choosing between alternatives and anything that comes should make it easier for the electorate to make a choice and that is why I think it is necessary," he said. According to him, one thing that the presidential debates seek to promote is to bring all the presidential candidates who are in quest of the highest office of the land on the same platform, side by side, so that the electorate, from the beginning, could, by taking in their physical appearance, make appraisal of the people and establish who they are. The second reason he gave was about the debate itself which helps the electorate make an assessment of the candidates as to whether they have solutions to the nation's problems. "It makes it possible for the electorate to make a choice, depending upon the performance of the candidate in the presidential debate." John Mahama, however, revealed that presidential debates are particularly useful for the middle class, professional, academician and others because they know what the issues are and as the presidential candidates talk, it enables them to evaluate the candidates very well. He regretted that it was unfortunate that Ghana has a highly illiterate population of almost 45%, which implies that it is only the educated class who can benefit from the debate because it would be held in the English language. "Because we have multiple languages, it is not possible to have the debates being conducted in the local languages. Aside from that, we have what we call the floating voter population in Ghana, which is estimated at about 20-25%. These floating voters are not committed to any political party and would make up their minds at any given time about whom they feel at the time of elections." "It is useless if you have the ideas in your mind but cannot express those ideas for people to assess," he said.